The Bible of Bibles is a partial philosophical, social and historical treatment on the nature God and the Bible and it’s many “predecessors”, like the sacred books of India and China. 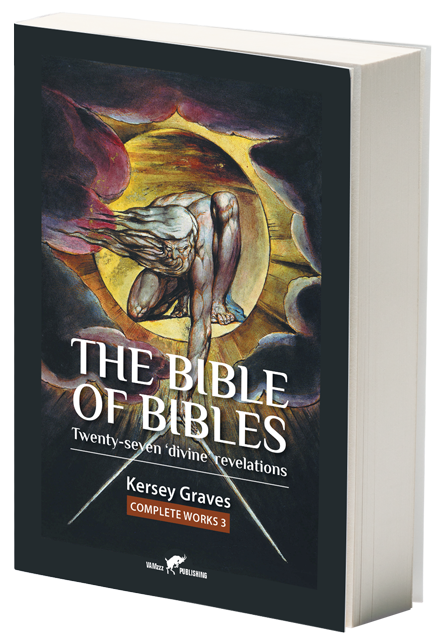 Kersey Graves deals with the common ground from which these holy books arose. Bibles are, in his view, a more or less natural product of a threefold division of man’s mental faculties working together, being: the intellectual department, the moral and religious department and thirdly, the animal department (which includes also the social). According to Graves, true religion does not regard God as a personal monarch, governing the universe by the caprices of an angry and fickle mind, but as the living, moving, all-pervading, self-sustaining, energizing, vivifying power which moves and sustains the machinery of the whole universe. Graves does not deny a divine force, but ridicules the assumption this force has a personality. Partially, by enumerating mistake after mistake made by many holy Biblical figures, including Jesus. Evil is treated in a more dialectic way and seen as a force that pervades not only the human realm, but the entire nature. It is seen as simply the negative pole of the great moral battery, and without it the battery could not be run. Without it there could be no morality, no moral principle or accountability, while man exists upon the present animal plane. In fact, morality without evil would be an unmeaning word. Kersey Graves was born in Brownsville, Pennsylvania on November 21, 1813 and past away on September 4, 1883 in Richmond, Indiana. That is physically, as this flamboyant skeptic, God-critic, rationalist, spiritualist, reformist writer, who gained so much popularity among the 19th century American free thought circuit, still manages to stir up the moods. His devastating comments on the Christian foundations and assumptions are still feared by those God-fearing believers who sold their soul to this religion, and Graves’ controversial books are still quoted and debated. The occasional modern historian who criticizes Graves historical research is mostly right. However, this offers the Christian believer little comfort. The point is, Graves cannot be solely commented on from the historical perspective alone. The latter would make him an easy victim of modern historians who hold the (rather extreme and ungrounded) vision, that every historical book written before 1950 is virtually worthless in the 21st century. Graves and his legacy are simply too big for academic shortcuts. The authors’ main objective was not primarily centered around academic aspirations. Instead, he wrote passionately about his subjects as the Bible, Christ, Satan and church dogmas, from the perspective of a socially engaged researcher, using the historical data of his time as a plaster, in search for uninvestigated, denied or repressed truths beyond our “taken for granted-Christianity”. For a better understanding of his argumentation and style a little insight in his Quaker background is invaluable. 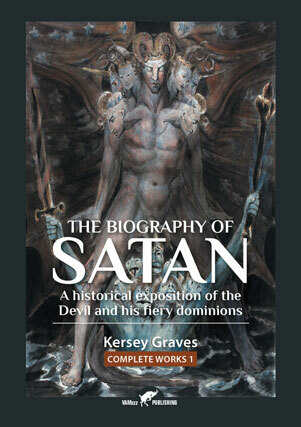 Read more about Kersey Graves in the post scriptum of The Biography of Satan. When you install fear, guild and punishment by eternal torture as the basis of society, then the psychological make up of most people get distorted and life in general tends towards structural un-happyness. Apart from this core message of his book, which has not lost anything of its actuality, Graves also provides a lot of historical data. Giving us insight in the origins of the many false assumptions the Christian faith build its’ empire on. The origins of the Devil, eternal punishment, Heaven and Hell are discussed, as well as evil itself within this context. 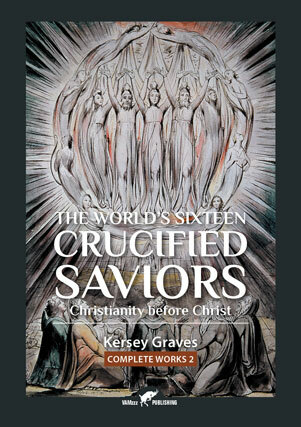 In his book The World’s Sixteen Crucified Saviors, American writer Kersey Graves shows that many demigods all over the world, share similar stories, traits or quotes with Jesus. The similarity between the story of Christ and his many predecessors gave rise to what is now called the Christ myth theory. This theory holds the view that the story of Jesus is either a piece of mythology, or, if Christ really existed, he had probably nothing to do with the founding of Christianity.